Global Agencies & Marketing, is a 100% locally owned trading commercial agency and technical services establishment for structural and architectural engineering. Specialized in the designing, manufacturing, supply and/or installation of various construction related products, and representation of oilfield services. Global Agencies & Marketing, was established in 1993 and managed by experienced and qualified Eng. Khalifa Al Maskary as the Director. Throughout 23 years of experience, excellent relationships have been developed with Government Departments, Consultants and Contractors that led our products and designs to be used in many prestigious government and private projects. By capturing such a niche in the market, we became the leader for all the products we officially represent. Global Agencies & Marketing, is an ISO 9001:2008, ISO 14001:2004 & OHSAS 18001:2007 certified company, offers a wide range of customer based design, architectural and structural engineered products. The installation and construction related works to support the above is carried out by our independent manufacturing division and professionals with our dedicated project management team. This has led to continuous repeated orders strengthening our position in the market, enabling us to compete and stay up to date on the major structural products. 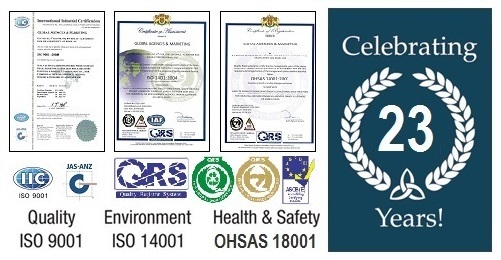 We believe our success stems from being a small, flexible and manageable establishment which is financially very strong, managed by experienced and qualified engineers, and our encouragement to the workforce including the sales executives, office support staff, to work as a dedicated team and committed to serve all parties to the highest standard and satisfaction.